DECEMBER MACRO UPDATE - RALLY ON THE FED'S DIME! Last weeks' rail data continues to show overall strength in rail shipping compared to 2009 and 2008 . There are new "red" levels however that may be signs of slowing, but as usual I'll watch and not get too worried or excited. Autos do pop out as an issue especially since the volumes are just so poor. I heard over the last week that at least one of the automakers (GM) was going back to their old games of stuffing tons of inventory on the books of the dealer lots and this was allowing them to make it look like production was strong and sales great. Think about it, wouldn't you do anything and everything you could to enhance your numbers going into an IPO? As that surge has hit, perhaps that is a reason for the slowdown in auto shipments. 2010 has been a much stronger year for rail shipping as you can see in the 4 week rolling average comparisons. We also see that the 4th quarter is one that will lead to a decline in volumes. AUTOS - http://railfax.transmatch.com/Perhaps I'm just believing the stuff I hear on CNBC that suggests that everything is better in the world, but I am shocked to see that the auto shipment data below is highlighting an early "cooling" in the auto space. Obviously there is a seasonal component to this, but it looks to have come a bit early compared to last year (and 2008 too). No real changes here. We'll see some data later on in the post that still continues to show scrap prices that are increasing. As many of you know I've been wanting to find a good index for tracking of trucking metrics. I've found one here I believe where much of the work is done for us. Ceridian in connection with UCLA produces real time data on the pumping of diesel fuel for inter-state commerce trucking. They put those figures into an index level we can track. The key reason that I want to track this metric is that I believe that much of the improvement in rail shipping is a result of a purposeful attempt by truckers to use intermodal shipping to become more efficient. In the beginning stages of the recovery we heard often that the increase in rail traffic was simply due to the fact that the economy was getting so much better. I started to doubt this because I was seeing more and more traffic on a rail crossing near my home that contained more and more JB HUNT tractor trailer containers. Yes, I've seen this before, but not in these volumes. My thought was simply that JB HUNT was making smart business decisions to avoid paying drivers and shipping those containers across the country. This all makes sense as long as fuel costs are high and rail shipping rates are low. I'll continue to monitor these levels and post them monthly. Here is the key takeaway. The October data shows the first 3 month decline in activity since the recession levels of January of 2009. WE SHOULD NOT BE SEEING A DECLINE IN OCTOBER, IT SHOULD BE THE STRONGEST MONTH OF THE YEAR in anticipation of the holiday retail sales season. This is an indication that the first quarter industrial productivity and other metrics will be lower than expected! Finally, while I spend a ton of time looking for these data sources, my friend Carzz at http://blog.rebeltraders.net/ sent me the link and I appreciate it. If you find an indicator you think is worthwhile, send me an email. 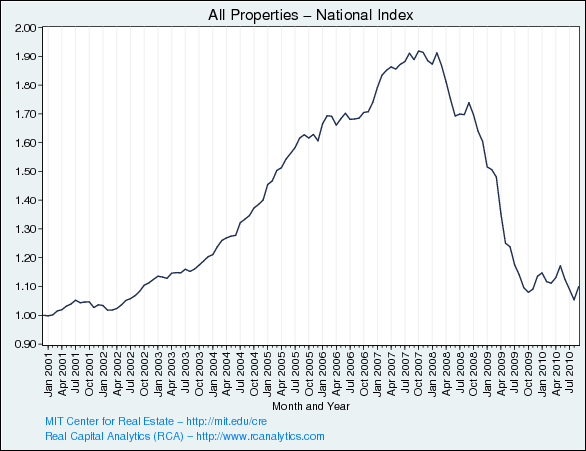 Property prices in September did rebound on the MIT/Moody's National Transaction Index for Commercial Real Estate. While I'm very giddy that we continue to maintain a base here, I simply am awestruck by the magnitude of this drop. 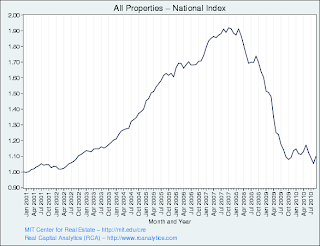 NAR AVERAGE HOME PRICE - http://www.realtor.org/research/research/ehsdataExisting home sale prices rebounded a few hundred dollars in the latest report from our friends at NAR showing October prices. As I've mentioned quite a few times it is so distressing to see how negative the impact the government's program of the housing stimulus was on buyers. In June and July of this year home prices rocketed up to an average of $230,000 per home as the tax incentives were being doled out. Now, just a few months later we see that home prices have fallen to right at $219,000 or a shocking $11,000 decline from the artificially high watermark. So the take away from the entire program is that buyers received $6,000 or $8,000 in "credits" in order to buy a home that was overpriced by at least $10,000 while the taxpayer ultimately provided those "credits". What a great stimulus. What a disaster. And we believe that any ideas to get this economy going by these clowns are going to work? Clearly the only winners in this debacle were the mortgage companies, banks, realtors, appraisers, and inspectors. Guess what, these were the same winners from the last round of real estate fraud we just endured in 2003-2007. We won't learn. The Monster.com Employment Index for November was released and we continue to see a decline in job offerings on the web. This "leading" indicator should be worrisome as it is a reversal of the employment picture that we need to keep the economy afloat. The is the second monthly decline since the September high of 138. The weekly leading indicators report from ECRI shows a tick up in again as we are in the area of the index at 125 where we were in May of this year. The WLI is indicating that improvements are coming. Scrap metal continues to make new highs and we should be taking notice. Our old mentor Alan Greenspan taught us quite a lot about blowing bubbles and this indicator was one of his favorites. We must also assume that since Mr. Greenspan felt like it was an important indicator, that he must also feel strongly that it's direction must also be up and to the right to signify that there is health in the economic market. Therefore, Mr. Greenspan and his younger protege Ben Bernanke must be giddy with the conditions they are seeing now (at least without any corrections for the declining value of the dollar). The Coppock 14-month average indicator is still signaling bearish warnings although it has done so for quite a while. As with every month I warn that this indicator isn't great in the short run. To give you perspective, the Dow would need to hit 11,900 by December's close for the indicator to actually signal a buy. The Financial Conditions Index again went positive this week as the slosh of liquidity and ever levitating assets in the markets continue their move. 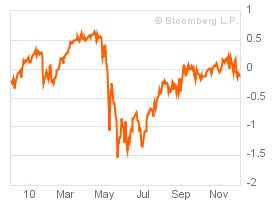 The index's move above 0 reinforces the idea that we are in an expansion phase (not recessionary). As we have seen all too many times recently the improvement is quite fragile and any shock to the system could put the recovery in doubt as signaled by the BFCI. The spot rate for shipping bulk dry good commodities across the world is back down again. It would really stink to be a shipper with high amounts of debt, of course there are none of those out there in the world, so carry on! There were some good things going on with shippers like DRYS as they reported good earnings and that they had locked up shipping rates for almost 80% of their fleet for 2011. I guess that is good news since the index rates are dropping. 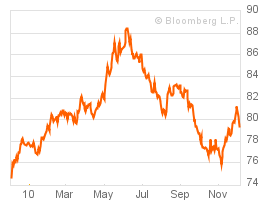 The USD Index below shows that the work of the FED has been quite successful since the scare back in May of this year. Remember in April when we were so worried that a little country like Greece could destroy Europe and the Euro? Those days seem like forever ago don't they? With a few clicks of the key board Uncle Ben has printed the USD into the abyss and pushed asset prices up, up, and away. In November, we had a bit of fear return as a little country named Ireland came into the news. Concerns over their banks and balance sheets have caused the USD to gain some traction. Never fear though, all is well in Europe and all it has taken is a few days in December for the USD's plunge to continue. There is no doubt that there may be a few more countries at risk in Europe, but a steadfast IMF and FED can do anything to bolster our confidence. Here's a very quick summary. We've got the WLI and BFCI moving higher but those are often simply derivative metrics that show the power of liquidity provided by FED. Trucking and employment are slowing and then we had that interesting employment report on Friday. 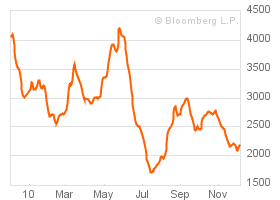 Despite the mixed signals, it doesn't matter, as long as USD dives, all other assets rise. Nothing to see here folks! The FED set the tone last month with the reaffirmation of the QE II strategy. As bearish as you want to be you cannot avoid the coordinated global efforts of the FED and central bankers to push markets higher. Whenever there is a move to adopt some sort of reasonable approach to fiscal responsibility, a crisis like those in Europe seem to raise their heads and force leaders to cow to the religion of more liquidity. Last month was one of those key months where I felt like I was finally getting back in tune with the market where I was anticipating moves down and feeling strongly that they were opportunities just to add more. The first few days of December have validated those convictions and my purchases of commodities and emerging markets in the face of these corrections have been rewarded. There is no doubt that there are issues in China and other emerging countries as they try to step on the brakes to keep from overheating as inflation is clearly hitting. Due to this it is important to watch continuously and is the reason that I have not added to my emerging markets positions in November. In my opinion, the overall trends in the US market and commodities markets are still higher (based on a falling dollar of course) so I'll continue to beat the drum of metals, energy, and commodities. Remember, we have at least 4 or 5 months more of QE II right? While the signs of contagion in Europe have been contained for a day or two we know that this problem is not solved. I can think of a scenario where we begin to see another crisis in February and March along with an undeniable slowdown in the US from a terrible holiday season. This is where I am looking to see the correction that has so far been non-existent and long over due. The headlines and concerns we are reading about the Bush tax-cuts expiration are a story to watch, not because I believe they will not be passed, but in the fact that this story may be the catalyst for another downward move in the markets which will provide yet another opportunity to add to positions or reposition poorly allocated investment dollars. If Congress does not approve the cuts by 12/31/2010, the incoming House will simply pass a measure and retroactively date them to keep them in place for at least another year or two. The Obama Administration will hate it, but will sign the measure. I have two updates on individual positions. Take a look at this long-term weekly chart of VLO. The 14 day EMA just crossed over the 40 day EMA (200 day MA). This should be quite bullish. I have no position just yet, but it is compelling. As we see a strong follow through move here over $21 will have me looking for a gain to $24.00. Followers on Twitter noted that I made a call to short NFLX right as the FCC Chairman stated that he supported the idea that distributors of content on the web should or could be made to pay for their consumption of bandwidth on the web and couldn't simply force it down the pipe and consume the infrastructure and resources of the highway providers (ISPs). Immediately I decided to short NFLX since they provide huge packets of data and flow them downstream to end users without paying for the cost of the highways to folks like AT&T and Comcast. The trade was entered at $202.50 and I have a target of $179.00 and $165.00 for exit. As always, when I have decent gains I begin to get focused on harvesting them. At $179 I will sell (buy) half of the position back and look for a further drop to the $165 area.